Yet another profile of what is generally described as “Trump Country” arrived this week. In this iteration, the Associated Press published a profile of voters in Sandy Hook, Kentucky. You might be able to guess the content of the article: voters in Sandy Hook voted for Donald Trump and, despite the President’s approval ratings, he remains “profoundly popular” in the “mountains” of this small-town in Kentucky, “a region so badly battered by the collapse of the coal industry it became the symbolic heart of Trump’s white working-class base.” The profile of Sandy Hook—a chapter in larger, ongoing AP project on “Trump Country”—is, by now, familiar, filled with a cast of increasingly stock characters and scenery. 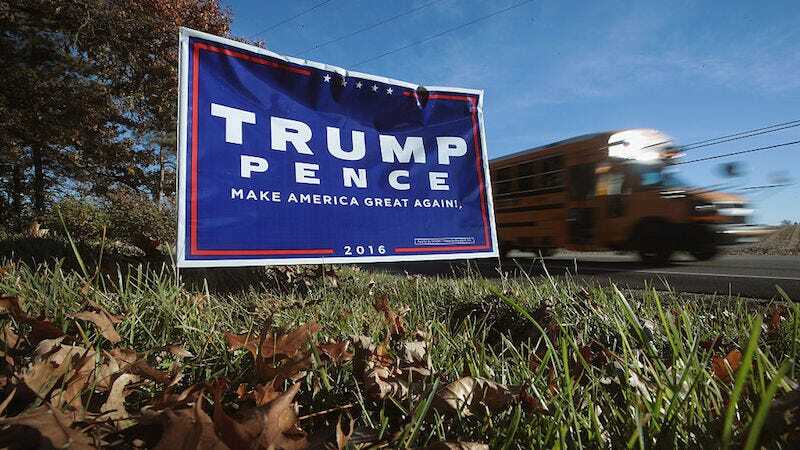 Here, as in a large number of profiles, voters in Trump Country—itself a place without literal borders but located in the spirit of small towns where either coal or steel once fueled the economy—eat at diners, long for the return of industry, struggle with money and sometimes addiction and, above all, love Donald Trump who, they often emphasize, will deliver them from a unarticulated blend of economic distress, modernity, and anger. Trump Country may be mythical but it resides, according to recent profiles, many places, including Johnstown, Pennsylvania, in Northampton County, Pennsylvania, in Linden, Tennessee where residents still say Merry Christmas, in Williamson, West Virginia, and all of West Virginia. Trump Country can be anywhere the Rust Belt, but the churn of the Trump Country profile prefers “bellwether” districts—counties and towns who were once staunchly Democratic but have slowly turned away from the Democratic Party, drawn instead toward the Trumpian rhetoric of restoration (the history of the Democratic Party in these regions is rarely mentioned, let alone contextualized). In these profiles, Trump Country is as much a site of nostalgia as it is a real physical location; its inhabitants are ciphers whose frustrations hold the key to our modern political turmoil. From these profiles, readers learn that white, working class, small-town voters feel forgotten but Trump, with his promises to bring coal back, makes them feel visible again. They inevitably live in towns filled with abandoned buildings—either empty factories or abandoned homes that signify a once thriving middle class—ostensibly metaphors for Trump Country itself—now abandoned and ramshackle, but once great. Other stock elements of the Trump Country profile include the inevitably the proud child of a coal worker, a lone Democrat, and the one guy trying to bring new industry to the town (whether or not the new industry—usually healthcare or tourism—can succeed is a question always posed with a certain breathlessness). These profiles strike as less a portrait of mythical Trump Country and more of a portrait of enduring American nostalgia. They, in part, represent a significant shift in how Trump voters are portrayed in the media. During the election, Trump voters were rendered as occupants of a Boschian hellscape—angry, uncouth, bitter and ugly to the point of deformed stereotype. Trump voters were of interest because they were grotesque. But since Trump’s victory, the grotesque has been swiftly replaced with a portrait of Trump voters that is a Hillbilly Elegy-esque requiem for the small towns and industries abandoned by the Democratic Party and forgotten by another equally mythical group of American voters: the elite. The transformation was swift and, as Ryan Cooper recently suggested, may say more about the makeup of the media than about Trump Country or its inhabitants. If the resentment of the white working-class voters can propel a caricature like Trump into the White House, those feelings must be worthy of microscopic examination. There’s a fascinated sympathy that defines the Trump Country profile; a deep interest in the feeling of abandonment, rather than its causes. In nearly every story, residents of Trump Country long for the thriving small towns that they once inhabited; they long, in particular, for the coal industry, dead and gone. But there is a very particular strain of nostalgia that runs through these profiles, one that whispers a kind of credence to the Trump slogan, “Make America Great Again.” Residents always and inevitably tell reporters that Trump’s promise to revive the coal industry will bring back good paying jobs, thereby restoring the local culture, and the pride inherent to it. Reporters dutifully quote these residents in the story, rarely stopping to reflect on the realities or the history of the coal industry in these regions. The Trump Country profile relies more on an almost Hallmark Channel-like nostalgia for a simpler, vanishing America and less on reality, taking the word of the stock characters that populate the profile, that these small towns were, in fact, once thriving centers of the American middle-class, produced through coal mining. This isn’t to say that some of these reports aren’t sometimes interesting or that they completely lack insight. But their sudden ubiquity is the origin of an electoral mythmaking, both of Trump County and Trump voters. The Trump voter has already done a quick transformation and, in the space of a year, has become something almost mystical, a piece of disappearing Americana grasping to the promises of the White House. The rural, working-class white worker of Trump Country isn’t the debased, angry, racist supporter that frequented Trump rallies. Instead, he or she is now “symbolic,” their anger transformed into a kind of inevitable lament for America past; racism or sexism is treated, like the abandoned buildings, as an increasingly natural part of Trump Country’s landscape. It is a myth, not simply because it’s fueled by nostalgia, but because Trump’s voters were not, in large part, the rural poor. The majority of Trump’s voters earned over the national average, somewhere between $50,000-$100,000. He also performed well with those whose income exceeded $250,000. “The narrative that attributes Trump’s victory to a ‘coalition of mostly blue-collar white and working-class voters’ just doesn’t square with the 2016 election data,” the Washington Post reported in June. And yet, the myth of Trump Country continues to be built, profile after profile. It is telling that the firmly middle-class, suburban Trump voter—the voter that propelled him to the White House—is ignored, as are the poor who, by a significant margin, cast their votes for Democrats. But we like our myths, and we are particularly fond of nostalgia, and Trump Country offers us both, replete with elegiac tone and abandonment. Do We Really Need Steve Bannon&apos;s &apos;Unfettered Thoughts&apos;? Again?